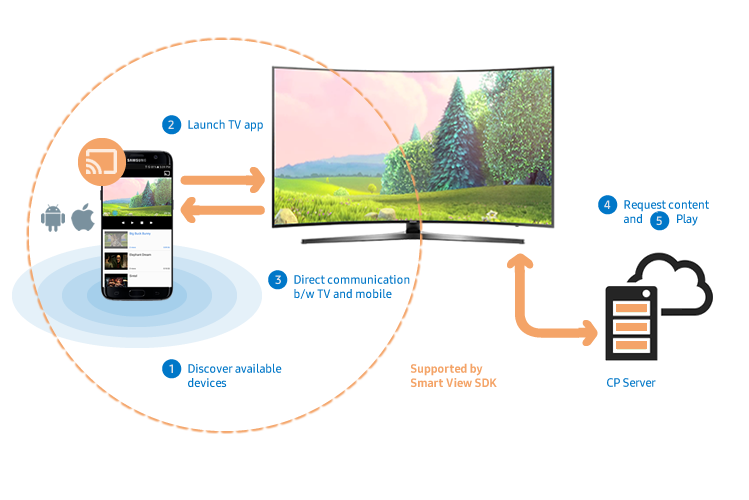 The Samsung Smart View SDK enables to create compelling multiscreen experience that connects mobile and TV or speakers. The SDK provides a set of APIs and sample applications that to support your integration. 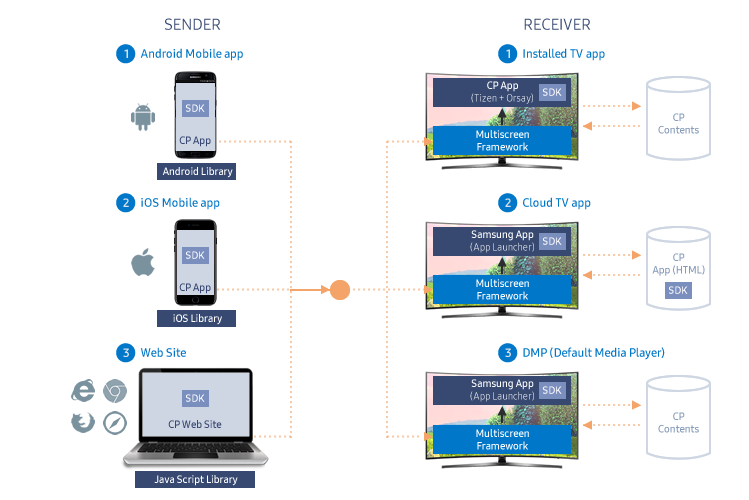 With the Samsung Smart View SDK, you can develop mobile apps that can stream multimedia content from mobile devices to Samsung Smart TVs. Be sure to review the SmartView SDK UX Guidelines for best practices. These are the types of application options you can create. When you create a Smart View enabled apps, you have to implement both the sender and receiver side applications. Addressable devices (TV year model) differ for TV platforms(Tizen/Legacy Platform) and types of Smart View enabled apps. Click here to find more details on each each type of Smart View enabled apps. * Cloud TV app on '14 TV will be available in 1Q 2017. Addressable devices for each feature differ from TV models as each feature may depends on hardware or software spec of devices. Meet other developers in the forum. Ask questions, find answers and communicate with others developing with SmartViewSDK. Make New Thread and select a category "SmartViewSDK"
You can use the emulator with the Smart View SDK to test launching both installed and cloud based TV apps also DMP. The emulator contains the exact same functionality as an actual TV, which allows you to fully test your application on your computer before you test on the TV. Refer to Receiver Apps.